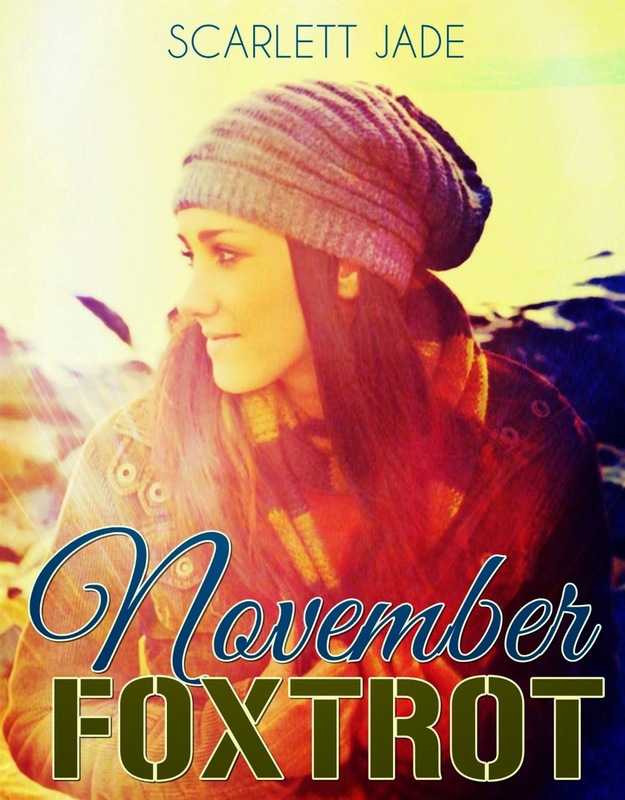 Bookends: November Foxtrot by Scarlett Jade ~ Blitz!! 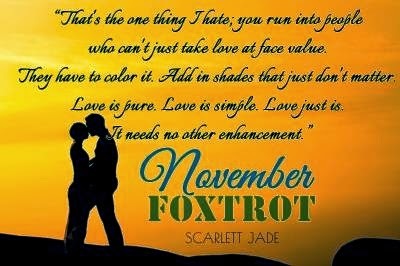 November Foxtrot by Scarlett Jade ~ Blitz!! 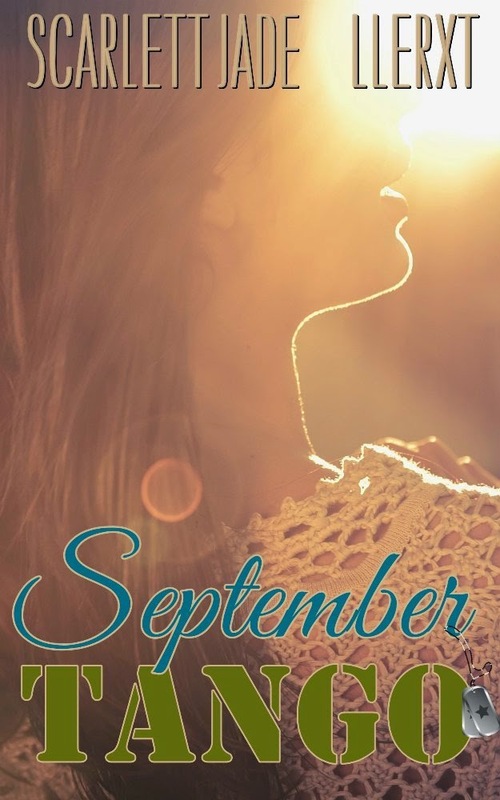 September Tango was last summer's whirlwind romance, and now Calvin and Zoe are back in November Foxtrot, the latest installment in the Rhythm of the Heart Series by Scarlett Jade. We learned about their lives and fell for their love story in September Tango, and now while they are apart we will be in the trenches fighting right along with them for their romance in November Foxtrot. Zoe has a secret that could tear the tentative bond they have apart. As the holidays arrive and they are brought back together, trouble mars the magic of their love. Life, death, drama and hope... Will their love survive? Or will their relationship become the refuse tossed among the waves on the beach? Zoe is left all alone in Colorado when Calvin returns to Afghanistan. And now, as the weeks pass, she has a secret...a secret that could crumble the precarious foundation of their relationship. As Christmas comes one shock after another leaves everything hanging in the balance... Life, death, and hope...Will they be able to ring in the New Year in happiness, or will the holidays be ruined? SEPTEMBER TANGO IS FREE EVERWHERE! Recommended for 18+ due to adult language and sexual situations. Zoe Parker and Calvin Hall grew up together in the small town of Major, Alabama but were always separated by one person, his ex-girlfriend and her former best friend Callie. Zoe always loved him from afar and he never noticed her. After being gone for five years with the military he is back home and over a campfire they reconnect and sparks finally fly. Their passion runs hot and lost time is made up for as he realizes she is what he wants. Lies, deceit, and pain mar the magic they've made together, and through it all they realize that the one constant they have is each other. When Calvin is called back early for duty will they keep on dancing or will it simply be a September Tango? 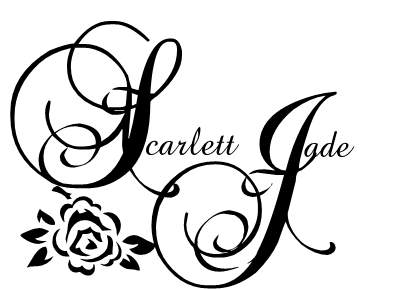 Scarlett Jade is just a small town girl with big dreams who loves to write. She has always been found from a young age with her brow furrowed, scribbling words on paper or her nose in a book. Now that she is grown, life isn't much different, she still scribbles words, but mostly on the computer, and her nose is permanently glued to e-books! She is married to the man of her dreams, her real life knight in shining armor and Prince Charming and has one son who is the apple of her eye. You can typically find her playing in the dirt with her son, toying with her indoor vegetable garden, or snuggled on the couch with her dog Peanut Butter, reading a good book. She loves chocolate, thinks coffee should be a religion, and loves to make people laugh with her quirky sense of humor. She is bold, brazen, and even been told she's ballsy, but she doesn't mind, she takes it in stride. She has a huge passion for all things paranormal and spicy love stories that leave you turning the pages and dying to slide between the sheets of the next book! 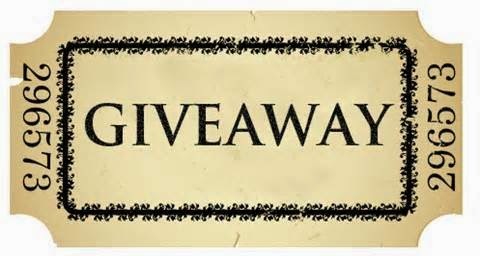 Scarlett Jade and blogger Not Everyone’s Mama are celebrating 4000 likes by giving away a $40 Amazon gift card. More than 40 authors and bloggers (and an editor) came together to add almost 70 other prizes for you to win! Ends 5/11/14 midnight CST.